› The travertine churches of East Jutland. 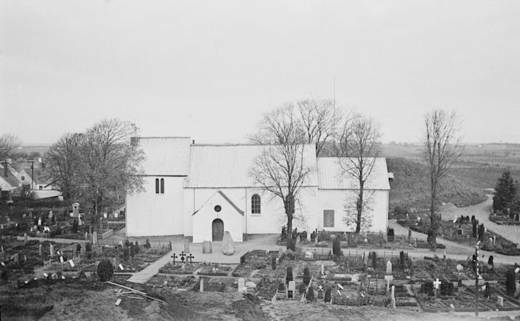 Jelling Church photographed from the South Mound in 1941. The church was built from travertine around the year 1100. The porch and tower are later additions. Photo: the National Museum. Denmark has numerous medieval churches, mostly Romanesque stone buildings from the period c.1100-1250. Before 1100 wooden churches were still dominant and the technique of building in stone was still in its infancy. The preferred building material for the earliest construction in stone was a type of limestone called travertine, which was found in large quantities regionally and could easily be worked into building blocks. The porous stone is found in a number of places in East Jutland, including Jelling Wood, and the Vejle area in particular is known for its numerous travertine churches. The stone church in Jelling is also built from travertine and as a result of its significant location near Harald Bluetooth’s monuments it is traditionally reckoned to be amongst the earliest in Denmark. The early date for Jelling Church is based especially upon the murals in the choir, which from an art historical perspective have been assigned to the second half of the 1000s. However, these have only been studied from illustrations. In addition, the sturdily re-built church does not have any secure bases for dating, which can add to the understanding of the building’s architectural background and cultural historical setting. If it dates to the 1000s the stone church may represent the last Christian manifestation of power in Harald’s Jelling. However, if it was built later than this then it belongs to a more general phase of stone church building, which is usually associated with the period after 1100. The answers to these questions must be looked for in the regional building, that can shed light upon the architectural principles involved in the travertine churches and also encompasses preserved murals connected to the paintings at Jelling. The Romanesque stone church at Jelling has not previously been compared with the numerous other travertine buildings of the region. A new investigation of the church will therefore contribute with a new and nuanced look at the church’s relationship to the other Christian monuments at Jelling and at the same time improve understanding of East Jutland’s other Romanesque travertine churches. Dendrochronological dating is also expected to be able to define when the building of travertine churches first began in this part of the country. Travertine is closely connected with the earliest stone architecture in Denmark, but after 1200 the material was still in use, and significant numbers of buildings are not necessarily early. The frieze on the eastern wall of the choir of Jelling Church shows the major achievement of the life of John the Baptist, the baptism of Jesus. Under the arcade arches to the right of the window in the choir stands Jesus with a cross halo. Watercolour by Julius Magnus Petersen produced after the uncovering of the mural in 1874. Photo: the National Museum. In 1874 the most easterly vault in Jelling Church collapsed and a picture frieze featuring almost full-size human figures appeared on the choir’s eastern and northern walls. The frieze was copied by the illustrator Julius Magnus Petersen in 1875. 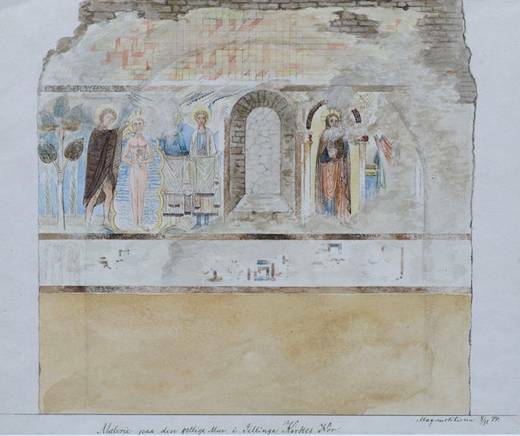 As part of the investigations of the travertine-built church, the surviving original fragments of the Jelling workshop’s murals from the choir will be analysed more closely, together with Magnus Petersen’s tracings and watercolours. The pictures’ connection with other regional murals, which can be connected with the Jelling workshop stylistically and iconographically, will be investigated at the churches. Material samples from the paintings will be analysed at the School of Conservation at the Royal Danish Academy of Fine Arts. Photo analytical methods, tracings, surveys and experimental reconstructions will be used, together with scientific analyses (thin sections, scanning electron microscopy etc.). 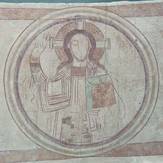 The project will first and foremost concentrate on the Romanesque murals in the churches at Tamdrup and Ørridslev, as well as looking at the apse paintings in Vrigsted church. The aim of the investigations is to produce greater knowledge about the methods and materials used in the production of the murals in these churches and determine their connection with Jelling. In addition, an attempt will be made to establish the dating relationship between the murals and the church buildings. The foundation of the murals will be analysed to establish whether the same type of composition and materials were used for the murals’ plaster and lime mortar layers, or whether there are differences that can be attributed to improvements in the workshop’s methods or to local differences in the supply of materials. In addition, focus will be placed upon the Jelling workshop’s use of colours, composition and the technical execution of the ‘trial models’ for the murals, primarily at Tamdrup. The components of the repetitions of the meander patterns in particular will be investigated more closely. Preliminary surveys of the murals at Tamdrup and Ørridslev show that these components of the meander patterns can be used to decode the proportions of the figure friezes and place the measurements of figures and other elements into a clear overall framework of understanding. For example, the almost complete accordance between the measurements and representation of the head of John the Baptist as a child at Jelling (tracing by Magnus Petersen) and a man in the crucifixion scene at Tamdrup, indicates a clear iconographic and dimensional connection between the murals. Project coordinators: Editor of Buildings Thomas Bertelsen, Danish Churches, the National Museum and Conservator Peder Bøllingtoft, the School of Conservation at the Royal Danish Academy of Fine Arts. Read more about Tamdrup Church (in Danish) in ’Tamdrup. Danmarks Kirker Århus Amt, hft. 52’ by Ebbe Nyborg and Niels Jørgen Poulsen (the National Museum 2002). Read more about the murals in Jelling Church (in Danish) in ’Danske kalkmalerier. Romansk tid 1080-1175’, edited by Ulla Haastrup and Robert Egevang (Copenhagen 1986). 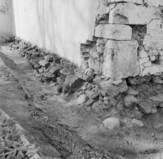 Travertine ashlars exposed in the south-west corner of the choir of Jelling Church. Photo: the National Museum.